Some experimental films draw on traditional notions of documentary and ethnographic film, but manipulate them with an increased emphasis on media specificity and concerns over how media works convey meaning and “truth” in non-fiction. On January 21, we featured a program of films by filmmakers based in Los Angeles. This show, however, will show films looking at Los Angeles by artists who weren't here for the long haul -- they were just visitors to our balmy climes. What truths about the city are these non-Angeleños able to see, and how do they express them? Featuring films by three superlative artists: Robert Nelson, David Lamelas, and Ben Van Meter. This screening is dedicated to Robert Nelson, who we lost this January. In 1968, Bay Area filmmakers and Canyon Cinema co-founders Ben Van Meter and Bruce Conner were invited to L.A. to talk about Underground Film on the Art Linkletter Show. David Lamelas describes it as "a study on American film production". 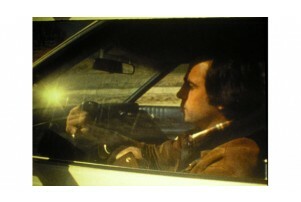 The Desert People begins like a classic road-movie. The setting is completely familiar to us: a car crossing the desert with a group of people traveling on board. But as soon as the narration begins, it is interrupted by documentary-style interviews. Passing in this way from one film genre to another, Lamelas manages to blur the boundary between fact and fiction. The five passengers describe their experience on a North American native Indian reservation. Each member of the group has his or her own perspective on the Papago tribe. One offers an anthropological analysis while another discusses writing a feature article for a women's magazine. They each present their version of the 'truth' about how the Papago live. Whlist they examine the tribe's social behaviour, there is little self-reflection on their own group dynamic. Born in Argentina, David Lamelas was originally a sculptor, but came to prominence when he represented his country at the Venice Biennale with a piece called Office of Information about the Vietnam war on Three Levels : The Visual Image, Text and Audio. It was here that he met Antwerp-based gallerists from Wide White Space and Marcel Broodthaers, and the contacts he made helped to precipitate his later move to Europe. After Venice he moved to London, where he studied on a sculpture scholarship at St Martins School of Art. 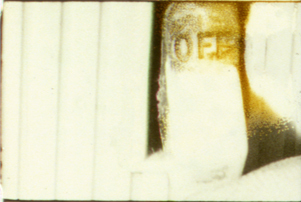 It was during his time in England, whilst using photographs and text as material, that Lamelas began working in film. Through a desire to "produce sculptural forms without any physical volume", the core concerns of his work emerged: time, space and language. During the subsequent years Lamelas has lived and made work across Europe and in America, each location exerting its specific influence on his work. And it is this personal experience of relocation and his efforts to understand and assimilate new cultures, that gives his conceptualist concerns a warmth and humour. For Lamelas, location and place are primary: "space has a reality, it exists". Yet about time he asserts, "Time doesn't exist, our consciousness constructs it. Time is a fiction." 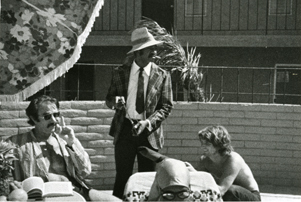 Robert Nelson's final completed film was developed from material he had shot in the early 1970s in Southern California while teaching at Cal Arts.